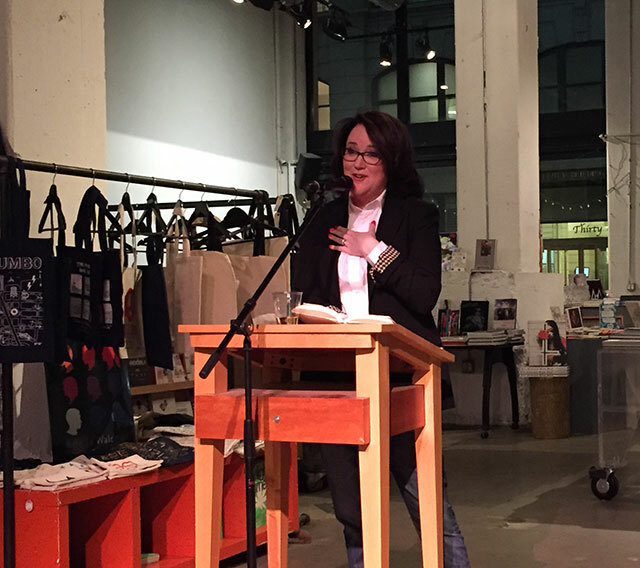 Helen Ellis launched her new collection of stories, American Housewife, at Powerhouse Arena on Tuesday. Ellis is a housewife living with her husband in New York City, but she is also a poker player playing tournaments around the country. Ellis read “Hello! Welcome to the Bookclub,” a short story about bookclubs. She describes the story as her favorite in the collection and says it was inspired by the two bookclubs she is a member of. Both clubs were in attendance supporting Ellis’s launch. Ellis has been a housewife for about ten years. That occupation has been the inspiration for a Twitter account, @Whattodoallday. She says she Tweets her thoughts as they come to her and that the Twitter account is really how she got into writing. The collection took two and a half years to write. She has three full novels sitting in a drawer, she said. But she likes stories because they are fast to write and provide some instant gratification. The gambler in her also enjoys submitting stories to places. She mostly writes between poker tournaments. Ellis enjoys reading genre fiction and also cites it as inspiration for her own writing. She is a big fan of Stephen King. Stories and Twitter are slightly different types of writing, she offers. She sees Tweets as more her natural mindset simply broadcasting her thoughts. Stories, she says, are more methodical.